Arrow sees Laurel fired as District Attorney, charged with murder, and on the run as the Star City Police Department hunts the Black Siren. Felicity thinks that Laurel can still be talked down from taking the dark path toward villainy. Dinah believes that Laurel is finally showing her true colors again. Meanwhile, Oliver and Diggle follow up on a lead that may take them to the person who killed Emiko’s mother. Laurel turns to Shadow Thief, who she met while working for Diaz. Using the D.A.’s access to court case files, Laurel targets the rich and corrupt, stealing their money and valuables. Felicity and Dinah put their heads together and figure out how Laurel is choosing her targets, then put a plan in place to try and stop her. Felicity wants to try to talk Laurel back from the darkness by proving that she still believes in Laurel. Felicity has not forgotten that it was Laurel who talked her out of killing Diaz when Felicity was at her lowest. Dinah, however, has not forgiven Laurel for killing her former partner and lover, Vince. She believes that Laurel is the only one responsible for her own choices. Felicity calls on Sara to help them capture Laurel. Dinah is upset that she wasn’t told of Felicity’s plan. Dinah reminds Felicity that they have the partnership with the Star City Police Department, but that doesn’t extend to Sara. Felicity and Dinah leave Sara behind when they go to confront Laurel, finding a bomb left for them instead. Sara knows that Laurel is a killer and that if she had wanted Felicity and Dinah dead, then they would have been dead. 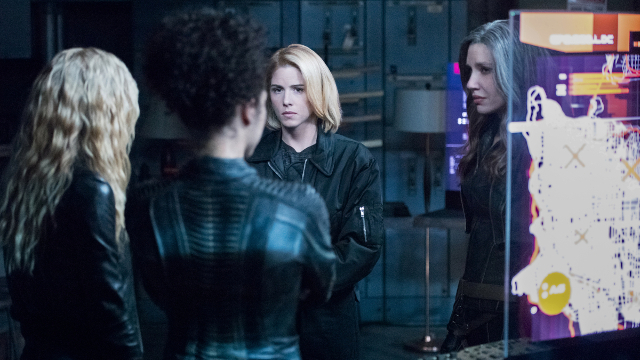 On the next mission, Sara goes along with the ladies, who appeal to Laurel’s good side and convince her not to steal an explosive for Shadow Thief. 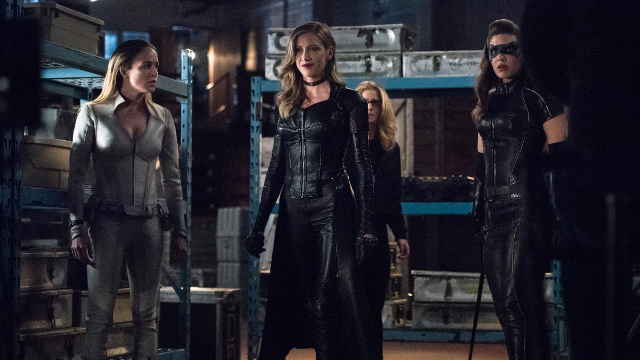 Laurel joins the ladies in the fight that sees Felicity destroy the weapon. After the victory, Dinah agrees to drop all charges against Laurel, but that’s not enough. Laurel is taking Sara’s advice and returning home to Earth-2 to set her wrongs to rights. In the future, Dinah has assembled an underground resistance of strong women standing beside one another. This is the canary network that Galaxy One is hunting down with its anti-vigilante equipment powered by the Archer program. Mia is emotional and wants to take the fight to Galaxy One instead of sitting back and waiting to be found. Dinah tries to convince Mia to wait and strike when the time is right, but Mia strikes out on her own. Mia is beaten about to be killed by one of the anti-vigilante soldiers when she is saved by Laurel and the remaining canaries, who finally make Mia realize that they are stronger together than alone. While the ladies rule the show, Oliver and Diggle trace the gun used to kill Emiko’s mother to Bear, one of the Longbow Hunters. Bear doesn’t know who ordered the job, but the details he spills causes Oliver and Diggle to suspect Dante. Oliver hopes that revealing the truth to Emiko will cause a divide between her and the 9th Circle. Share your reaction to Arrow season 7 episode 18. Post your thoughts in the comments below!